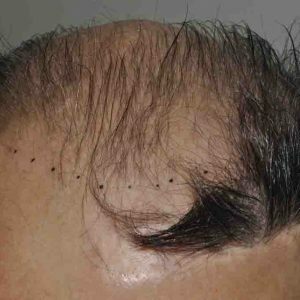 This patient is a great example of a hair transplant repair. Patient before his repair with Dr. Lindsey. This patient had been through the “wringer” with a series out outdated scalp procedures performed in the 1980s. The patient underwent a procedure (which is no longer performed) called a “scalp flap” and “scalp reduction,” where pieces of bald scalp are actually removed and pieces of scalp with good hair are moved into their place to create the appearance of a full head of hair. Not only were these procedures very risky compared to modern, minimally invasive hair transplant surgery, but they often resulted in an unnatural appearance. This patient had bad luck twice: not only did he have an unnatural flap/reduction approach, but he also encountered complications; the movement of the flap failed and the tissue didn’t take. This meant the flap of good hair didn’t survive, so the patient was left with the same amount of balding skin and now had scarring and an overall unnatural appearance on the scalp. He sought Dr. Lindsey’s repair services. Dr. Lindsey outlined a three part plan: 1) an FUT (strip) procedure to camouflage some of the unnatural appearance in the front; 2) a removal of the failed flap from the original surgeries; 3) one final strip procedure to thicken and naturalize the entire scalp. Left: The patient after failed “scalp flap/scalp reduction” surgeries. Right: After his hair transplant repair from Dr. Lindsey. To see more results from Dr. Lindsey, view his HTW profile.